Hydne right 2015. Pawel Karczmarczyk has shared an album from a Hydefossen-adventure in february 2015 (requiers google+-account). 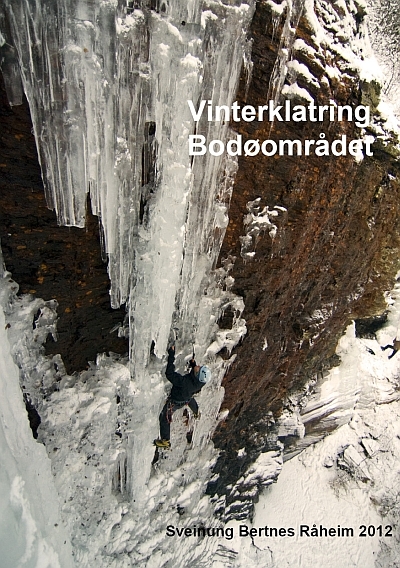 The 2014-edition of the winter climbing guide book for the Bodø area is out. Available at Skandinavisk høyfjellsutstyr in Bodø. NOK 299.-. 164 pages, new maps, new climbs etc. New winterclimbing guide for Senja! Bent Vidar Eilertsen / Senja Lodge has made a mini guide for winter climbing on Senja / North Norway. Read the guide here. Mats Peder Mosti, Steinar Grynning and Jo Arve Repp. Mats and Steinar climbed the first two thirds 15. July 2014, but turned a pitch up the upper headwall. They returned the 30.August, climbed the normal route, rappelled down the headwall, cleaned and tested the crux pitch, then pulled down the rope and finished the route. The route share the first pitches of the original North face route from 1985. The climbers places no bolts. There is a knife blade piton on the crux pitch. The picture below is from the excellent Stetind guidebook. Yellow marks the first attempt from Mats and Steinar. Green marks the final attempt for Steinar, Mats and Jo Arve. Click here for a topo of the climb. Pawel Karczmarcyk and Martin Skår Olslund climbed a new, hard route at Vettisfossen 26.2.2013. The line goes to the left of the main waterfall, start with three hard mix-pitches, then three pitches of WI5 and 6 to the top. Pictures and topo will come! 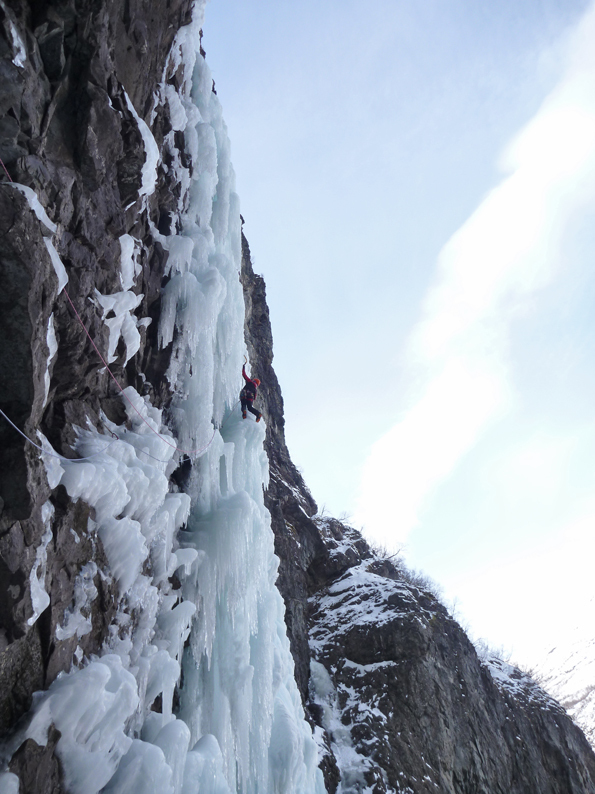 Long standing projects climbed in Bodø-area: Fyrtårn, WI6+, 250 m, Slettliflågfossen, WI6, 300 m (11.3.2013). 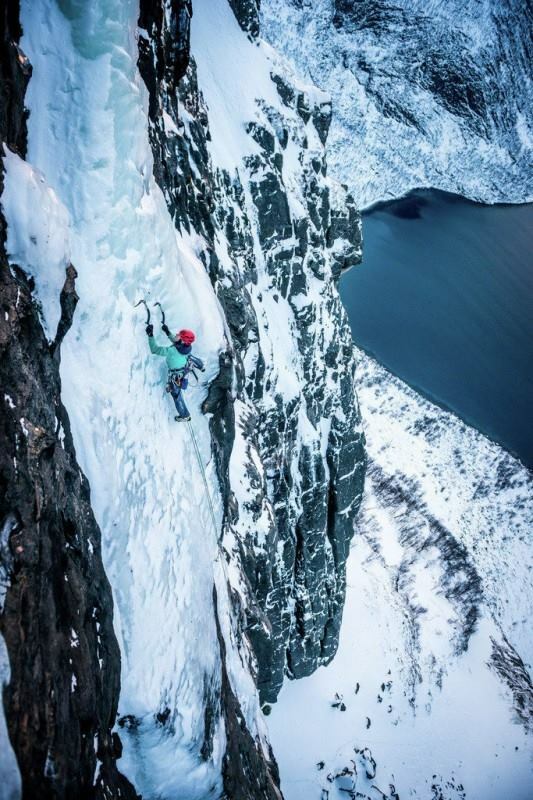 The strong austrian climbers Albert Leichfried and Benedikt Purner have once again visited Northern Norway and climbed a lot of hard ice lines. This time they went to the Bodø area and stayed there from 10. to 17. February. Among highlights, they got first ascents of Fyrtårn in Novika and Slettliflågfossen in Beiarfjorden. Both these waterfalls have waited a long time for their first ascents. 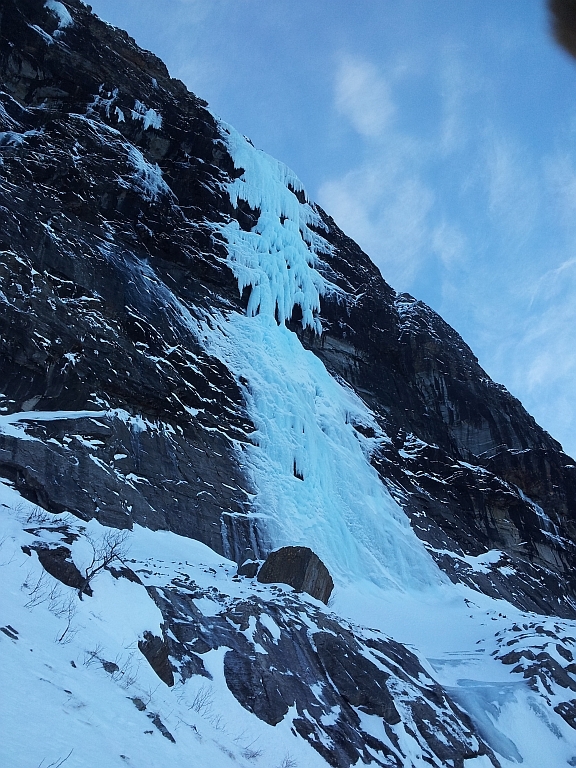 More pictures will come, for details, check out the Gildeskål-part of the Ice climbing guide for Bodø-area. Andreas Klarström and Martin Skaar Olslund went "All in" on Abrahams tind, Lofoten 3/3-2012. Poorly protected climbing up to WI7 and M8 sent in onsight style. For more beta and cool pictures, check out this album . Abrahamstind was opened with the "Swiss route" in 2009. The first album shows Andreas Klarström and Martin Skaar Olslund praticing on Das Fenster, Rjukan, while the second shows some sweet roadside cragging in Lofoten. A new guide book for the Bodø area is now ready. Available from Skandinavisk høyfjellsutstyr in Bodø or via Sveinung Bertnes Råheim. Winter climbing from Saltdal and Gildeskål in the south to Sørfold in the north. 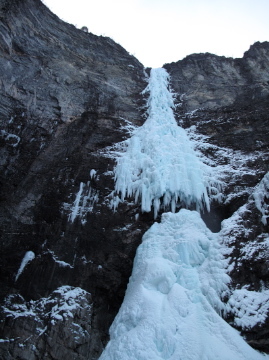 Frozen waterfalls, mix climbing, alpine peaks! Bakkekollen in proper conditions! Rarely formed, rarely climbed, 1.5 hours from Oslo! Definitely on of the best lines of eastern Norway. The last time Bakkekollen was climbable as a pure iceline was (as far as we know) back in 2002/2003. The line is exposed to the sun, so the conditions won't last for ever... Our Bakkekollen album is updated with 11 new pictures. See also our topo for more information. Hydnefossen in Hemsedal and Langåni in Vang are in good conditions. Langåni is exposed to the sun, but will hopefully be climbable a few more weeks. Hydnefossen often get better conditions later in the season. We have prepared an album showing current conditions. Thanks to Fredrik Moell and Martin Skaar Olslund for information and pictures! Fine conditions at O'hoi in Stavadalen (Valdres). See more pictures at the isupdate page at facebook. A new guide is available for download for the Sørdalen and Bardujord area in Troms. 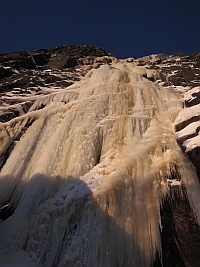 The guide presents some of the best ice climbing in Northern Norway. In late february Albert Leichtfried and Benni Purner sent two new interesting lines in Sørdalen, Troms. You can see pictures and get some more information by clicking here. There is also a note out on alpinist.com. Isklatring.no will come back with a topo for the area later on! 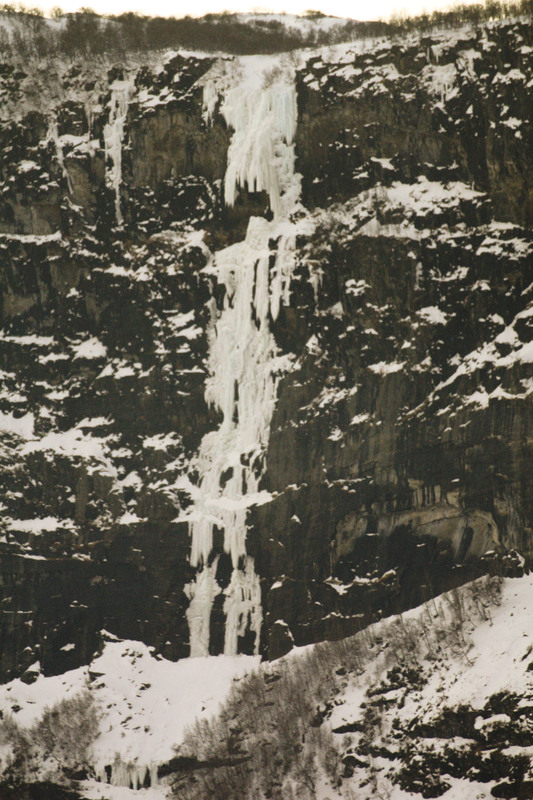 Hydnefossen often provides excellent conditions late in the season, and can often be climbed until the easters. This year seems to be no exception! Our new topo also describes some rarely climbed variations. We have had several questions about conditions at Langåni at the moment. None of us has been threre lately, but here are some pics from today. See album. Make your own jugdements! We have also reports that Måbødalen is not good at the moment (from 27.2.2011). Martin Skaar Olslund and Mikjel Thorsrud sent this obvious (but rarely formed?) line 30/1-2011. Probably a first ascent according to updated sources. Adventurous climbing, highly recommended! As you will see from the album, there seems to be possibilities for a desperate (but beautiful) direct start (estimated grad WI 6-7). But remember one ting: NO DRILLED BOLTS!!! Check topo and album for further details! Resent report from Jan Petter Brenfeldt says the conditions on the classic Langåni in Vang, Valdres are good. Pawel Karczmarczyk and Per Lindberg did the first winter free ascent of the route Smørbukken in Kristiansmokollen the 22.1.2011. The initial overhang was given M7+, the rest of the route M6/M6+. 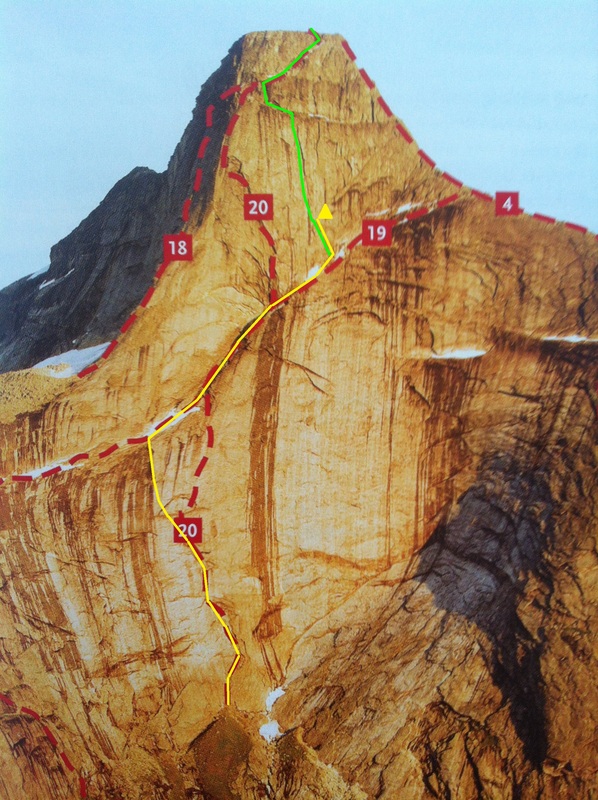 The route is 3 pitches, 120 m, and was first put up as a summer route in 1995 by Paul Bakken & Sveinung Råheim. The team has also repeated several other classics of the area under less than ideal conditions. Check album!! Two ascents so far in january. Click here for more pictures. 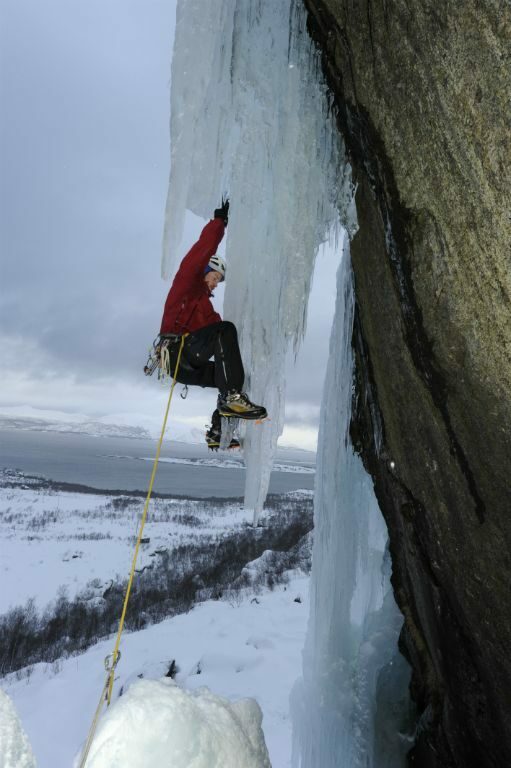 The conditions for ice climbing are good in Bodø this winter. Longer periods of cold weather with a littlebit of rain and mild air inbetween have given good supply of water and lot of ice forming. Among lots of interesting things to do, there is good conditions on the exotic "Poseidon" (see picture below). 4 pitches straight out of the see, only possible start is from a boat! 13-16 januar 2011 går Ecrin Ice Festival av stabelen for 21. gong. Nydeleg isklatring, drytoolkonkurranse, kurs og ikkje minst konsertar og fest på kveldane. Rimeleg overnatting i Gites eller liknande. Meir info her: http://www.ice-climbing-ecrins.com/. (Kjelde: Francois Lombard). Jonatan Hulten & Anders Carlson frå Göteborg klatra Vettisfossen den 8/2-2010. Dei hadde følgjande å seie om forholda: "Bra skick, lite smålurig travers in på pelaren, galna formationer och ganska blött. Antagligen precis som den brukar vara." Det er ganske sannsynleg at forholda er minst like bra no - absolutt mulegheiter med andre ord! Kulda dei siste vekene byrjar å vise seg i fjellsidene på Vestlandet. Vi har motteke nokre bilder frå Knut Elde Johansen som viser Skrikjo, ein muleg ugått, lang og bratt foss mellom Odda og Eidfjord, sjå kartutsnittet under. I følge informasjon Knut fekk av folk som bur der er det sjeldan denne fossen frys heilt ned. Gudvangen in western Norway is home to several world-class routes. These lines provide around 1000 meter of continuous steep ice-climbing. Some of the lines are climbed, but the greatest line was still untouched before Robert Jasper introduced his climbing ethics to Norway. Over two attempts in early February he and his friends placed a huge number of bolts before they "completed" it February 19. Many climbers used to consider this super-line as the number one alpine challenge in Norway. It makes up the most perfect line of ice one can imagine. For over a decade it has frightened mind of climbers, visitors as well as Norwegians. What makes it so creepy is a combination of the thin ice on the steep introductory slabs and the huge overhangs midway. The overhangs (used to) represent something unknown, and it was not possible to assess from the ground whether it was possible to climb through it or not. 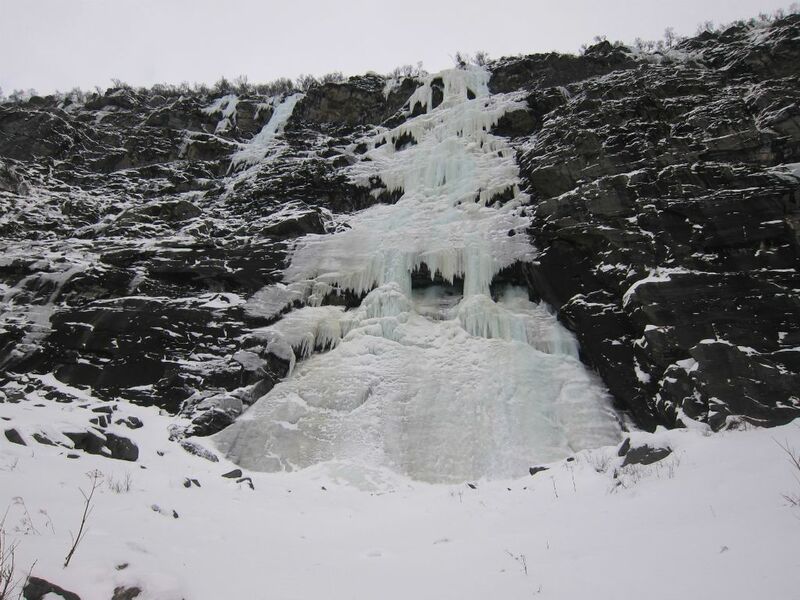 The deal is that if you climbed up to the overhangs and discovered that they were impossible to defeat, it would perhaps be impossible to return by abseiling as the ice is (usually) far too thin for ablakovs / v-threads. Therefore the line demanded either exceptionally good conditions, or very confident climbers trusting their abilities to down climb all the way back to the valley floor. Robert Jasper is for sure not the first internationally reknown climber who has realized his limited abilities when confronted to this line. 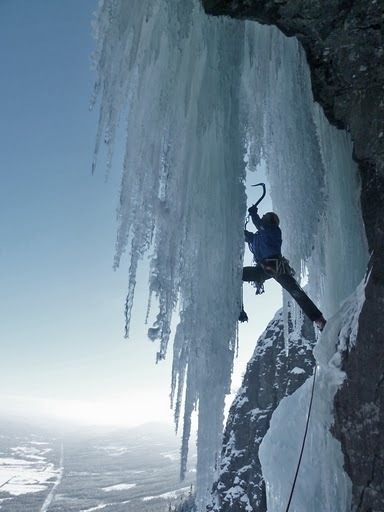 Several climbers have recognized the potential this line offered to move the standards of modern ice-climbing to the next level. But instead of waiting for the right conditions or working on his mental skills, Jasper decided to take the route down to his own level. Robert Jasper and his friends have placed bolts for the lead climber through the overhangs, as well as establishing bolted rappel anchors all the way from the overhangs back to the valley floor (nine pitches). 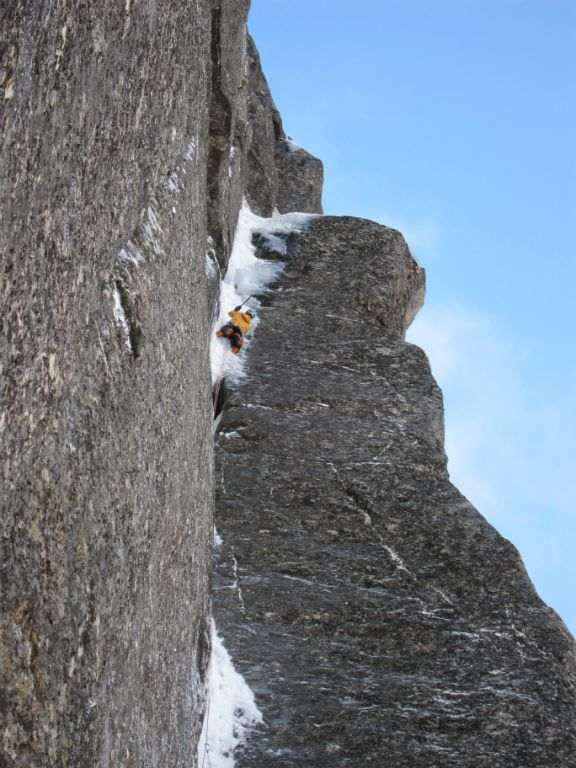 If the style and climbing ethics introduced by Robert Jasper was accepted in Norway, this kicker of a line -10 minutes approach from the main-road- would probably have been sent 10 or 15 years ago. The reaction among Norwegian climbers is a mix between disbelief and shock. a) Number of bolts on belay-stations which can be used while climbing (ascending). d) Was it possible to make belays without placing bolts on the first 9 pitches? Or wasnt the ice thick enough in the conditions when you climbed? Finally, a few words on climbing ethics in Norway. Foreign climbers are welcome to visit Norway and climb new lines. But we expect visitors will take into account the local climbing ethics. It is ok to bring a few bolts as part of the safety-kit, but they should only be used if necessary to avoid tragedy. Similarly, it is allowed to bring guns at Svalbard in order to defend one self against polar-bears, but it is not allowed to go hunting! It is also illegal to place bolts without a permission from the landowner, and if the place is within a national park or nature reserve. Bjørn-Eivind Årtun and Stein Ivar Gravdahl first climbed Strandhogg (800m, WI6, M5, A0) in a single long day in february. This is a full-scale big-wall ice climb ascending the front wall of Kjerag. 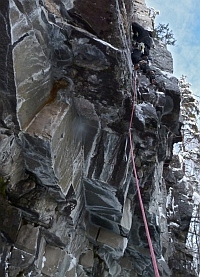 After 200 meters of mixed climbing, ice follows the steep wall to the top. Everything was sent in free exept a short A0 pendulum. There is done several amazing new lines on ice in Norway recent years, but this one takes things to a new level. A new classic?? Unfortunately the line is frequently sweapt by big avalanches of snow and ice which make this a noicy place to stay in winter. Check the video (commentary in norwegian). Two days later, Bjørn-Eivind and Annelin Henriksen climbed Pin-up (600m, WI6), in hengedalen (a few houndred meters further right on the Kjerag-massive). 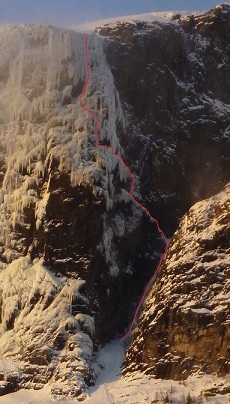 Probably the line is located between Its easy and the area classic Svigermors drøm (two ice-lines first climbed in 2006). 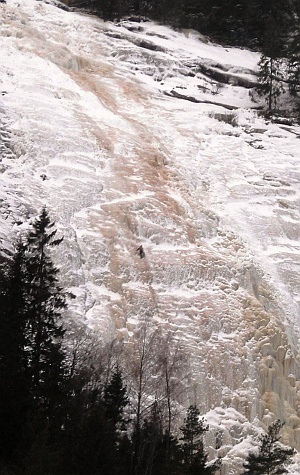 During recent years, Måbødalen in Eidfjord have proved to offer the most stable winter conditions for long difficult ice routes in western Norway. Several new lines are climbed this winter and probably all the obvious stuff is finally sent. However, there is still potential for a lot of new things on mix-terrain. We are working on a web-guide for Måbødalen, so please send ut information about ascents. Here we will only mention some new routes allready reported in other medias. Illusjonen, WI 6, 300 m. An exposed first pitch, then easy for the remaining 250 m. Climbed by Andreas Klarstrøm and Annelin Henriksen 14.desember 2008. 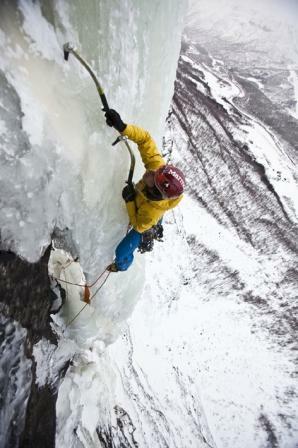 The area classic To ydmyke krigere, WI6, 250 m, was free-soloed by Andreas Klarstrøm 30. december 2008. Tapphoppet, WI 7, 340 m. First climbed by Andreas Klarstrøm and Erik Grandelius, 31 december 2008. Seven pitches, two of them grade 7, and far as we know, the hardest ascent in Måbødalen to date. The first crux pitch is 50 meters unprotected slab climbing, the second one was a free hanging ice-pillar (20 m. unprotected). Reaching the pillar involved a jump from the rock onto the ice, hitting the ice with one axe while completely air-born. The day after the entire pillar was gone. To stutt-tjukke hverdagshelter, WI 5, 200 m. and Tyssvikobekken, WI 4, 250 m, climbed by Arild Arnesen and Thomas Lium. The former is located just left of To ydmyke krigere, and the latter right of To ydmyke krigere and left of Instant classic. Landeplage WI 7-, E4, 240 m. First climbed by Robert Jasper and Markus Stofer 6. february, by adding bolts on belays and between. Completely unacceptable. There is no need for bolted anchors in Måbødalen, and spectacular lines are reserved for bold climbers. We do not want to downgrade this gorge to just another crag. Please help us keep Måbødalen bolt-free. Norwegian climbers visited Patagonia november and december 2008. Bjørn Eivind Årthun and Marius Olsen first ascented an amazing ice-line near the Poincenot serac". Hvit Linje, 600m, WI5. "Hvit linje" is norwegian for "white line". Quite surprising such a beutifull and obvious line remained unclimbed at a destination like Patagonia though! Picture and text. Ole Lied and Trym Atle Sæland climbed an interesting link-up of the Compressor and the Ferrary route. This is the so-called "Corkscrew" link up, a line which can provide a bolt-free line to the top. However, they where forced to use some of Maestri's bolts before traversing west due to a mushroom along the SE ridge. The bolt free Corkscrew is still waiting for ascents. Source. Bjørn Eivind Årtun and Oscar Alexandersson (sweden) did the first free-ascent of Ultimathule on Blåmannen, located on Kvaløya outside Tromsø in northern Norway. More details later. Sindre Sæther and Ole Johan Sæther did a new route in Semletindvegggen 2.-3. juli 2008. The route goes right of Gammelt nytt and left of Amatt/Baillie. Many of the pitches are poor protected. Everything was climbed in free, and the grade is supposed to be solid 7+ (7a) according to Bjartes web site. Later in July, the same team did what is supposed to be the first free ascent of the historic Norske-ruta (Norwegian route) in the Trollwall. The grade is 7, and the climbing was done in a day (sub-24 hours) 26-27. july. Source: red. 29. of july they free climbed the Czech winter-route (just right of Gammelt nytt) with an alternative upper part. The grade is not yet known. Source: red. Andreas Klarstrøm and Oscar Råstrom did a very impressing free climb on Kjerag 24-25 of july. Their plan was to free climb Skjoldet (7b+) in an afternoon-push. Their strategy was climbing light and fast, and for some reason they thougt it was a good idea to start the approach from Geiteneset after lunch, 13:00. According to Klarstrom they would have plenty of time to get back to Lysebotn later the same evening. They started climbing at 15:00, and a few hours later, arround 23:00, they found them self hanging on the exposed white, overhanging piece of rock which is called the shield of Kjerag. So far everything was sent in free onsight (including the 7b+ cruxpitch where they suggest a downgrade to 7b). Their only problems where: 1) it was getting dark, 2) for some reason they did not bring a topo for the route. As a result they started traversing right (15-20 meters underneath the original traverse which make up pitch 16 of Skjoldet), into preveous unexplored terrain. The first pitch was 15 meters, grade 7, and very poor protected. Early in the morning, after overnighting on a two foot ledge, they realized they where off-route. They also realized it was a bad idea to return back to the scary traverse. So they did another short pitch out right (grade 7) before climbing to the top mainly via the upper pitches of Littlejohn Jones. Everything was sent in free onsight (second climber as well as first). Rolf Bae, Bjarte Bø, Sigurd Felde, and Stein Ivar Gravdal made the second complete ascent of the Norwegian Buttress (VII 5.10+ A4) on Great Trango Tower in Pakistan. The ascent required 27 days, followed by three days to descend. The ascent took place may to june, 2008. They are the first to climb the route to the top and sucsessfully descent. In other words an improvement of style. On April 28, 2008, Norwegians Nils Nielsen and Eiliv Ruud made the first ascent of Kuriositeten (AI5 M3+, ca. 800m), on a nameless peak between Mt. Bradley (9,100') and Mt. Dickey (9,545'), Ruth Gorge, Alaska Range, Alaska. According to alpinist.com the norwegians found "interesting and fun climbing on relatively moderate terrain; they believe the line has potential to become an area classic". 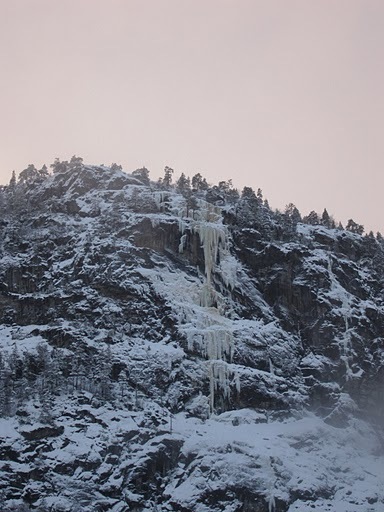 On february 12, Guy Lacelle, Audrey Gariepy, Mathieu Audibert and Chris Alstrin did a new ice-line Thermalphobia (300 m, grade 6), in Vedalsjuvet, 5 km south of Øvre Eidfjord. The line has a 170 m section of steep ice, and is supposed to be well worth the 500 meters of elevation gain on the approach. PS! : Thermalphobia is the left-most of the two lines in the canyon. The right-most is a lot harder, waiting for the right combination of conditions and climbers. 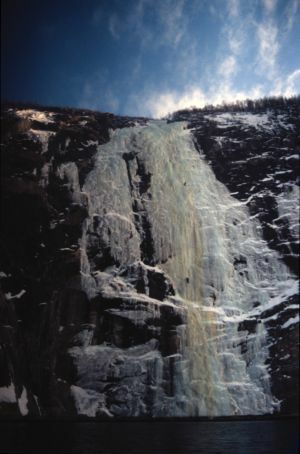 Andreas Klarstrøm made a free-solo ascents of the great classics Lipton at Rjukan (4. of february), and Hydnefossen in Hemsedal (10. of february). 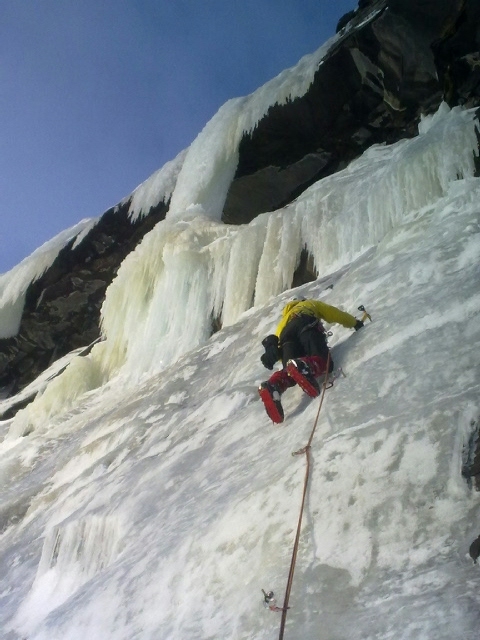 Both make up about 150 meters of sustained and difficult ice-climbing at solid grade 5. Lipton is preveously free-soloed by Carlos Wagner, and Hydnefossen is also done in the same style earlier by Guy Lachelle. Martin Jakobsson (sweden) and Mikjel Thorsrud made first winter ascent of Skjoldet (A3, 18 pitches) at Kjerag in Rogaland, south-west in Norway. They left Lysebotn 9. of january, and were not back there until 23. They brought food for 10 days only, but a lot of strong wind made it difficult to make significant vertical progress some of the days. In addition, they had 2 days where climbing were not possible, one of them due to a very exciting storm. Bjarte Bø and Eiliv Ruud sent Borte bra, hjemme best at Gravdehaug, Romsdalen, december 2007. Five pitches, grade WI5+. Check out the picture. Kristen Reagan and Mikjel Thorsrud made a first ascent of the route Hjemme best (7-, M6, A0, 13 pitches) at Skogshorn, 19-21 of december 2007. Everything was sent in free (onsight) exept for the short A0 sequence in the very last pitch. For the first 5 pitches the route goes up a preveously unclimbed pillar, which should make this route the longest on Skogshorn. It tops out 40 meters right of Sentralpillaren. Extremely good winter conditions made it possible to climbe 5 of the pitches in free using sport-climbing shoes and chalk. These pithes goes at 7-, 6+, 6, 6 and A0/5+. The 6+ pitch was the crux-pitch, ascending a 3 meter overhanging, extremely loose diedhral. The remaining free-pitches was on solid rock. Two of the mix-pitches goes at M6, the remaing 6 pitches was easier mix-climbing (typically arround M4) and some snow slabs. We will come back with a topo later on. In the meantime you can find a picture of the (approximate) line here. In october 2007, Halvor Dannevig and Nils Nielsen climbed a new line on the southwest face of Phari Lapcha (6017m), The End of the Beginning (M4 WI3 ca. 900m). Sindre Sæther and Ole Johan Sæther did the first free ascent of the old A4-aid line Amatt-Baillie in Semletindveggen (also referred to as north wall of Søndre Trolltind), just left of the Trollwall. The main wall takes 13 pitches of very sustained climbing at grade 6 and 7. The last 7 pitches follows the Original-route/east-pillar to the top. Links: Amatts report from the 1967 first-ascent. A free-topo for the route is available here.